Photo by Edward Steichen, 1931. Edward Molyneux was born in London of Irish parents. At age 17, he won a design competition held by British couturier Lucile and began sketching for her design house. During a stint in the British army from 1914-1917, where he earned the rank of captain, he was injured and lost sight in one eye. When he returned in 1919, he opened his own couture house in Paris and in time followed that with branches in Monte Carlo, Cannes, and in London. 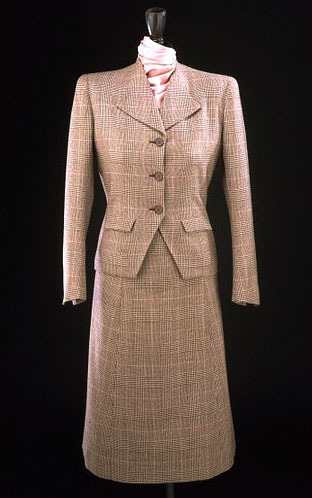 He was known for conservative, well-bred, fluid, elegant clothes with a pure uncluttered line. 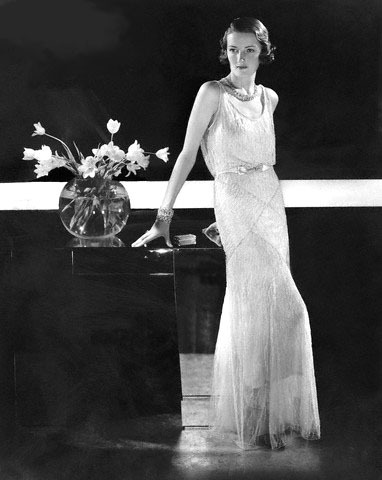 Even his evening dresses possessed simplicity and a touch of severity. His customers were never over- or under- dressed. In 1934, Princess Marina of Greece ordered her bridal gown and trousseau from Molyneux for her wedding to the Duke of Kent. This single commission made his reputation in royal social circles and his future clients would include the Duchess of Windsor and actress Merle Oberon. In 1939, he relocated to his London branch offices. During WWII, Molyneux designed Utility clothing – garments that met the strict fabric ration laws set up during the war. He also provided clothing that could be used in films produced by the British film industry. In addition, he was commissioned, along with other British designers, to create uniforms for the women in the British Armed Forces. He later reopened his Paris house in 1946 and at that time enhanced his business by adding furs, lingerie, hats, and perfume to his available products. In 1950, when the vision started to fail in his remaining eye, Molyneux decided to closed his Paris and London establishments and retire to Jamaica. 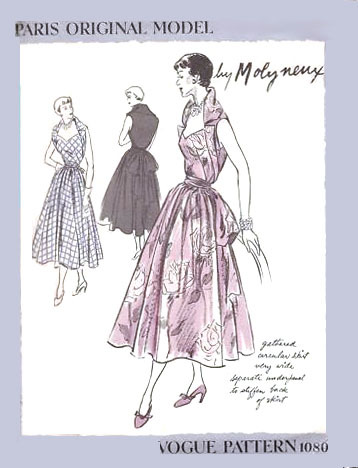 Home Sewing Connection: Molyneux designed a few Vogue Paris Original Model patterns. 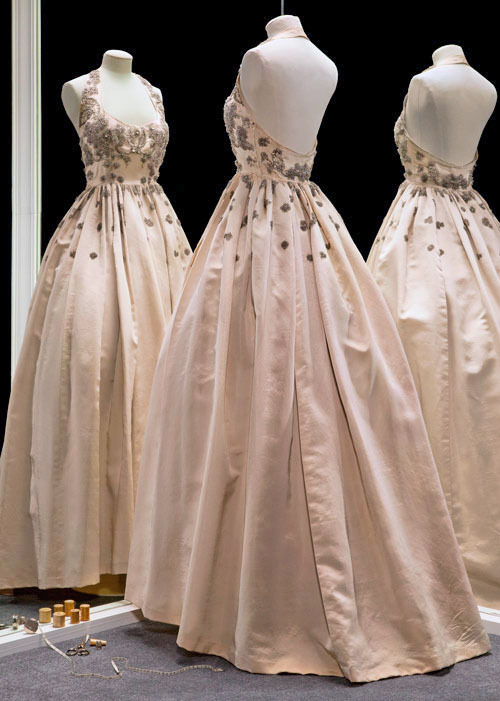 Gown with glass beads, 1949. Molyneux insisted that his staff wear pale gray uniforms the same shade as the walls in his salon. He was known for printed silk suits with pleated skirts, capes with accents of bright hot pink and for the use of zippers to mold the figure. Interestingly, Molyneux produced a fragrance in 1926 called Numero Cinq even though Coco Chanel’s very similarly named No. 5 was already in existence. During the war, Molyneux turned over part of his profits to the UK National Defense. Sources: The Fashion Spot; Fashion: The Century of the Designer, 1900-1999 (1999) Charlotte Seeling. I have been meaning to thank you for quite awhile now for these wonderfully succinct posts on various designers. They have made my inbox a joy to open and with each one I have learned something about a favorite designer, or been introduced to someone new, not to mention being thrilled at the beautiful garments photographed so brilliantly. Thanks again, It’s a pleasure to recommend your site to my sewing students. I am currently working on making a Utility Suit myself. I love this photo depicting this designer’s version. It was great to see what else he has designed. Thanks for the post! As a National award winning American Industrial Designer of medical equipment and product design it was extremely interesting to see my ancestors designs and learn about his design philosophy and humanitarian efforts. I discovered he and I are very much alike. It gives me goosebumps to feel the genetic kinship. Thank you! Tom Molyneaux retired, now a painter, sculptor and bird watcher in Kissimmee Florida.